As part of your weight loss diet, blueberries are best eaten raw to maximise their nutritional benefit. Anthocyanin’s give the blueberries their wonderful color. 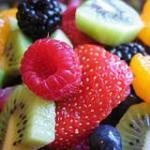 They are thought to help give added protection against both cancer and slow down the process of aging. Cancer benefits are not yet conclusive as the research has been on animals rather than humans. Blueberries contain many different phytonutrients, which are thought to act as an anti-inflammatory. 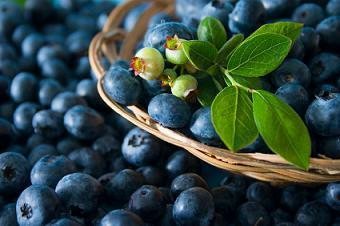 The polyphenols in blueberries have been shown to stop the formation of fat, according to a university in Texas. They also contain a number of carbohydrates including sucrose, glucose and fructose which give us energy and the fruit their sweet taste. Blueberries regulate our blood sugar levels and are therefore thought to help reduce the effects of type 2 diabetes. Other blueberry benefits are believed to include added protection against cardiovascular diseases, and lowering our blood pressure. They contain a good source of fiber and 16 % of our daily recommended intake of vitamin C, and 17 % of manganese which is thought to be good for building our bones. The US Department of Agriculture devised an antioxidant measurement called ORAC which ranks blueberries as one of the best fruits. They should be eaten fresh, as they only last a few days before they start to go mushy. Blueberries can be frozen; research has shown that frozen blueberries retain their nutrients. Blueberries are very low in calories. According to the USDA nutrient database, they contain just 57g per 100g serving. They contain no cholesterol and are very low in fat. 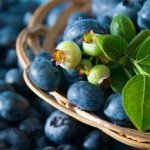 Compare blueberry nutrition facts to the other fruits.